This might be considered a companion piece to yesterday’s post on Celery Vases in that with one significant difference it might be hard for today’s collector to tell the difference between a spoon holder and a celery vase. In short, celery vases are tall enough to easily hold celery stalks while spooners, sometimes called spoon holders, were much shorter so that the handles of the spoons stood above the rim of the holder. Spooners sometimes looked like handled sugar bowls, however, the absence of a ring in which a lid would have seated will confirm the piece is a spooner rather than a sugar bowl. Knives and forks were usually kept in drawers while spoons were kept in spooners on the table. Spooners were made of cut glass, silver, white metal, Brittania ware, etc. The glass ones were clear, colored, or clear with colored accents. Spooners were squat or sometimes on bases increasing the height of the overall piece without making the container too tall to hold the spoons. Silver bases with glass inserts and round, silver combination sugar bowl and spoon holders also decorated many a Victorian table. A spooner might have one handle or two. Spooners were often offered as prizes at agricultural fairs, given as prizes for subscriptions to magazines, or given as wedding or anniversary gifts. Miss Caroline Schermerhorn Astor, daughter of William Astor and great grand-daughter of John Jacob Astor, received a silver spoon holder and “several sets” of silver spoons when she married Marshall Orme Wilson in 1884. Not all modern gardeners have grown celery so one might doubt its popularity in times past, but I have yet to see a gardening treatise or catalog that doesn’t discuss growing celery. Cookery books encouraged the liberal use of it as a seasoning and as a salad which might have been as simple as crisp celery in a celery vase. The Victorian celery vase or glass was an essential part of a well-dressed table from the 1820’s into the 1910’s although some journals advised readers the celery vase was being phased out in favor of a boat-like dish in the 1890’s. The vases grew in popularity until mass-production flooded the market. “Celery is sometimes chopped small and mixed with a dressing made as directed for lettuce; but the usual way of preparing them is to scrape and wash them clean, and let them lie in cold water till just before they are to be sent to the table; then wipe them dry, split the ends of the stalks, leaving on a few of the green leaves, and send them to table in celery glasses. Celery should be kept in a cellar, and the roots covered with tan to keep them from wilting.” – The Kentucky Housewife. 1839. When celery was served at table, those who desired to do so, helped themselves to a stalk, dipped it in a little salt on one’s plate and ate it. The celery was expected to be tender and crisp when served alone. “To Crisp Celery. Let it lie in ice water two hours before serving. To fringe the stalk, stick several coarse needles into a cork and draw the stalk half way from the top several times, and lay in the refrigerator to curl and crisp”. – Vaughn’s Seed Store. 1898. Celery was no exception to the “waste not, want not” approach to food. “There need never be any part of a bunch of celery wasted. Serve the small, white stalks whole with salt, or cut fine and dressed as a salad. Cut the larger stalks into short pieces, cook in boiling salted water and cover with cream sauce. The very coarsest pieces may be boiled and strained for soup. Nearly all soups may be improved by the addition of celery. Dry the leaves in the oven, then chop or rub fine and they are nice for seasoning soups”. 1904. Now, gentle reader, let us look at recipes for various prepared dishes of celery which might dress our table for that next special occasion meal. Celery Salt. 1904. This is very nice to season oysters, gravies, soups, etc. Dry and grate the roots of celery and mix with one-third the quantity of salt. Put into bottles and keep tightly corked. Celery Fried. 1786. When boiled, dip it in batter, fry it of a light brown, and dry; pour over melted butter. Celery to fry. 1818. Cut off the heads, and green tops of six or eight heads of celery; take off the outside stalks, pare the roots clean have ready half a pint of white wine, the yolks of three eggs beaten fine, salt and nutmeg; mix all together with flour into a batter, into which dip every head, and fry them in butter; when done, lay them in your dish, and pour melted butter over them. Celery Sauce. 1818. Boil celery heads three inches long, in a little stock, till nearly done and the liquor almost wasted away, then add some béchamel. . .
Celery Fritters. 1909. Make a batter of two eggs, one cupful of milk, a tablespoonful of melted butter, one cupful of flour, and a pinch of salt. Boil until tender in salted water stalks of celery cut into four inch lengths, drain, cool, and dry. Dip in batter, fry in deep fat, drain, and serve with Hollandaise Sauce. Creamed Celery. 1909. Clean, trim, and cut the celery into short pieces. Boil until tender in salted water, drain, and reheat in a Cream Sauce. Sprinkle with grated nutmeg if desired. Diced cooked carrots may be added to Creamed Celery. Cabbage and Celery Cooked. 1909. Cut cabbage fine, and soak in salt water, drain and add equal amount of chopped celery, cook until tender, drain and sift a little dry flour over the hot cabbage and celery, cook the flour, add milk, when done add one beaten egg; serve at once. Escalloped Celery. 1909. Chop celery very fine or cut in half-inch lengths and cook until tender in boiling salted water to cover. Drain and reheat in a cream or White Sauce. Put into a buttered baking-dish in layers, sprinkling each layer with grated cheese or crumbs or both crumbs and grated cheese. Have crumbs and cheese on top, dot with butter, and brown in the oven. Oysters also may be put between the layers. Celery-Potato Croquettes. To a pint of mashed potatoes add half a teacup of cooked celery, season with a tablespoon of butter, half a teaspoon of salt, a dash of white pepper; add the yolk of one egg. Roll in shape of a small cylinder three inches long and one and a fourth inches thick. Dip them in the beaten white of egg, roll in cracker or bread crumbs and fry. Cream of Celery Soup. 1909. One-third cup of celery cut in pieces, two cups of boiling water, one sliced onion, two teaspoons of butter, three tablespoons of flour, three cups of milk, salt and pepper to taste. Cook celery till soft, rub through sieve, scald milk with onion in it, add to celery, bind and season. Stuffed Celery. 1913. Mix cream cheese with enough cream to moisten it; season with salt and cayenne; chop 8 olives and ½ lb. English walnuts and mix with cheese. Select short wide pieces of celery, trim off most of the leaves and fill with cheese mixture. Unruly children are not a problem solely relevant to current times, although most agree the situation worsens with each passing generation. The following is extracted from “Nurse”, Vol. 4, June 1916. Parents who let their children do as they please do the children no favor, they leave the naughty ones with no self-control, self-respect, or respect for others or the property of others, while parents who establish parameters for proper behavior raise children whom everyone enjoys being around and who go on to live productive lives. Let’s see what our expert had to say in 1916. The mother of ‘my children’, as the little woman called them, and I had often talked this matter over so my answer was ready. We believed it was because, from the day of their birth, they had been taught the blessed lesson of obedience. The woman looked at me vaguely, as though she did not quite understand the language I spoke, and then said, in a tone of despair, ‘I suppose I ought to begin to teach Janie to mind me, but I had not thought her old enough.’ Poor woman! She had lost as many years as Janie was old. Poor Janie! She was badly behaved only because she had not been taught otherwise, and, if her father and mother at that late date were to take her training in hand, it meant a reconstruction period such as parents and child need never have encountered had they had the proper understanding of each other from the very beginning…’”. Parents of young children, ask yourselves this: Are my children sweet and loving, well-behaved and a pleasure for me and others to be around, bringing joy and pride to my life, or do you say no, maybe several times, but give in at the end and allow the child to do as it pleases? If the latter, you do the child an injustice. I will leave you with an example from our 1916 article. A young child came to the table, put a foot onto the tablecloth, quite inappropriately, an act made worse by the fact the parents had guests witnessing the uncouth behavior. The child’s mother asked repeatedly for the child to remove its foot from the table. “Oh, but the table isn’t the place for Molly’s feet. Now, that is the place for Molly’s feet—right—down—there. No, I said not on the table—not—on—the—table, NOT—ON—THE—TABLE! Oh, well, it won’t hurt the tablecloth any”. The mother had set the stage for Molly to be headstrong and unruly for life by not enforcing discipline when the child refused to do as she instructed, much the same as modern parents are to blame when children are noisy, boisterous, argumentative, and altogether unpleasant for all in earshot. Sunday, after mass, we stopped for breakfast during which we were subjected to the loud ranting of a man sporting a mouth full of gold teeth who clearly had no self-respect and no respect for anyone around him. 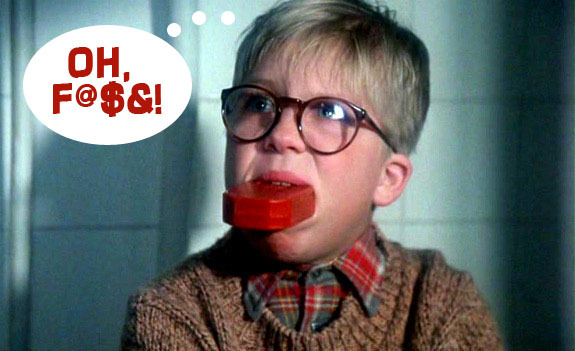 Every other word he spoke was an obscenity, not quietly spoken to his breakfast companion, but practically shouted so as to make sure he was the center of attention for all present, oblivious to the discomfort of parents with children or other adults who were offended by his language. I find such behavior deplorable and can’t help but wonder what happened to the days when someone like that would have been asked to leave the establishment, and/or taken to jail for disturbing the peace. One such word was enough for my cousins and I to get the, “Go pick me a switch” admonishment, we’d probably still be wailing from the beating we’d have gotten after such a spectacle. He also suffers under the delusion that the world owes him a living, if his obscenity-laden tirade about having to buy his own car was any indication. Having not been born with an inherent entitlement complex, we instinctively looked up and rolled our eyes at the same moment, and the memory of walking into a bank at 17 years old and convincing the banker I was responsible enough to borrow money for a car on a 90-day note, without a co-signer, came flooding back. I saved practically every penny of my salary and had that car paid off by the end of the 90 days. No one ever told me I should sit back, collect government assistance, and expect someone to buy me a car. Frankly, I’m disappointed; my life might have turned out quite differently had I known I didn’t need to work every day to pay for what I want. The guy’s potty mouth naturally had me looking for 18th century references of such behavior which I will share. “Swearing and Cursing is always prosligate, but the most prosligate is that which is practiced in good humour, and without provocation”. Prosligate was defined as a licentious, dissoulate person. Licentious, in turn, is defined as, “Disregardful of the laws or principles of morality”. That fits the present situation perfectly. I guess his mom never used the, “Go pick me a switch”, theory of child rearing. – Richardson, Samuel. A Collection of the Moral Instructive Sentiments, Maxims, Cautions, and Reflexions. 1755. London. Disney, John. A View of Ancient Laws Against Immorality and Profaneness. John Disney defined cursing as blasphemy against Men and condemned swearing by God, or Christ, in ordinary conversation [taking the Lord’s name in vain]. Such profanity comprised a large part of the fellow diner’s vocabulary and was an unwelcome assault on my senses, especially having just come from mass. John Ray called such language a great abuse of speech and outrageous effects and expression of malice and wickedness. I concede the word wicked applied. – Ray, John. The Wisdom of God Manifested in the Works of Creation. 1722. London. What was done in times past to control such behavior? Cursers were fined, with the amount of the fine going up with each subsequent incident, and, “Offenders not paying the penalty, to be committed to the house of correction, and kept to hard labour for 10 days”, or set in the stocks for a prescribed number of hours. Any constable who failed to impose the penalty was, himself, fined and/or confined to the house of correction and kept to hard labour for one month. – The Gentleman’s Magazine and Historical Chronicle. June, 1745. In a country where criminals have more rights than citizens, I suppose it’s too much to hope for that such laws and the enforcement of them might be reinstated. I remember the 1960’s and the way American culture changed during the Viet Nam era. I remember when manners and etiquette were considered too old-fashioned and everyone was encouraged to do their own thing. I say it’s time to find another Amy Vanderbilt and bring back proper decorum. Recently I had two bad experiences while eating on the road. One was at a Golden Corral on the Alabama Georgia border. We ducked in for a quick lunch while on an antiquing binge, and I watched this girl go up to the salad bar and put sliced pickles into a bowl. Then to my utter disbelief, she picked up the pickles out of the bowl, licked them, and put them back into the container on the salad bar. I found a waitress, told her what happened, and she promptly took up the container and refilled it. She then stayed near enough to the bar to keep an eye on the child who kept returning without adult supervision and assist her, whether she wanted it or not, to make certain she didn’t do it again. I was dumbstruck that any child in the U.S. could be raised with such total lack of respect for others, but pleased that the waitress took the matter seriously and did all in her power to rectify the situation. Last weekend we rode the motorcycles over to Meridian, Mississippi and I saw the same scenario replayed at Ryan’s. A girl about 10’ish walked up to the salad bar and filled a bowl with peaches, placed her hand over the fruit, and poured the juice back into the container. I watched her then dump the contents of the bowl back into the container and move on to the container of pineapple and do the same thing. From there she literally skipped to the hot bar and was playing in the food there as well. It quickly became obvious she was not eating the food, but handling it playing in it, totally unsupervised by her mother. I told the waitresses what was happening and one said she’d tell the manager to replace the food. I don’t know whether any of them relayed the message to the manager or not, but the food was never replaced. After about 15 minutes with no one making any effort to remedy the situation we left and you can bet the farm we won’t go back. What has happened to America that we’re willing to allow such behavior? We post messages in rest rooms that employees must wash their hands, yet children are allowed to spoil food others are expected to eat. Who knows where these kids’ hands have been or how long since they were washed? Because I find this behavior so repulsive I’ve vowed to report it to the health department any time I see it, and I encourage anyone reading this to do the same. 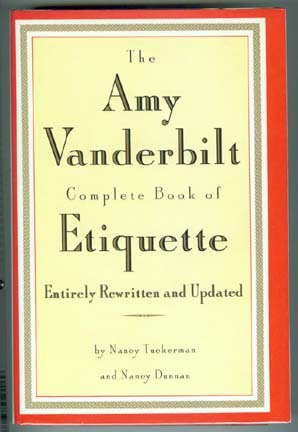 NOTE: Amy Vanderbilt (1908-1974) was America’s leading authority on etiquette. Her book has been edited and is still in circulation today.